Preparing for a Role: Ready for Performance! The pre-battle speech is an icon of literature, stage and film. From Shakespeare’s Henry V admonishing his band of brothers on the field of Agincourt to William Wallace admonishing his Scottish army to Knute Rockne encouraging his boys to “win one for the Gipper.” Most of us have experienced the mental preparation and psyche up before we are to participate in a big event. Performance on stage is no different. Weeks of preparation on Ah, Wilderness!, hours of tedious rehearsal, and the combined efforts of a small army of cast and crew culminate this week in just four performances. Every stage troupe has their own unique pre-curtain rituals. Some are very ritualistic and others are more loose. It’s been fun for me to enjoy being part of the pre-show ritual with the Theatre Central cast this week. 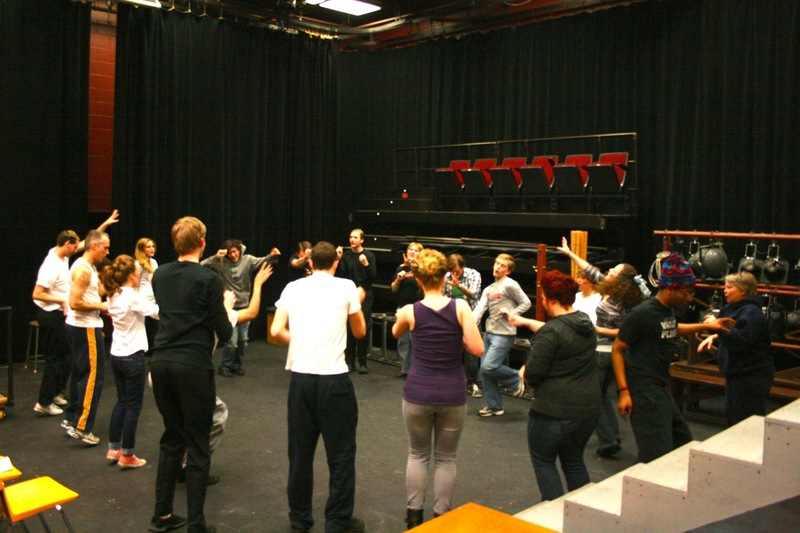 Each actor is given his or her “call” time by the Stage Manager(s). This is the time you are required to arrive and begin the make-up process. For Ah, Wilderness!, some of the ladies have more time consuming hair preparations for that 1906 coiffure, so their call is earlier than most of the cast. My call has been one hour before curtain, so I have arrived at the Kruidenier Theatre Center on the campus of Central College about 6:30 each night. Hair and make-up is the first order of business. Me and Jake Anderson getting ready in make-up alley. I start with wetting down and plastering my hair with goop to get that slicked back look. Then apply make-up. The harsh, bright stage lights tend to wash out natural complexion, so stage make-up helps to balance this out. Foundation, eye-liner, rouge, highlights and wrinkle lines are applied and then powdered. Yes, I do this myself. 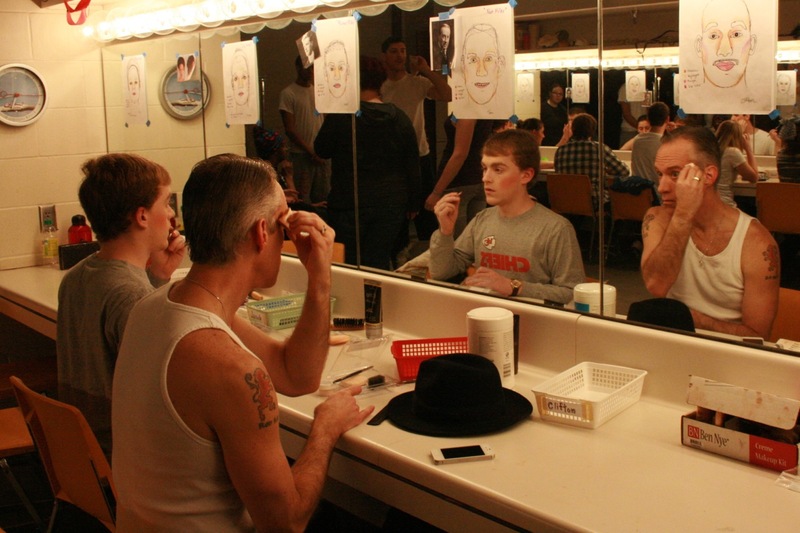 Most stage veterans learn the process and take responsibility for their own basic stage make-up. It’s generally only when more complex make-up techniques are required that a make-up artist is brought in. The hair and make-up time is also a social time. Actors do this together, music is generally playing and there’s a lot of good natured joking and jovial conversation going on. It’s during this period that Stage Managers also remind actors to “check props.” It is ultimately the actors responsibility to make sure the items you need on stage are where they are supposed to be. Once in make-up, I put on the iPod ear buds. Since college my requisite pre-show psych up has begun with the Talking Head’s Psycho Killer followed by Burning Down the House a ritual I picked up from my roommate and senior theatre classmate, Kirk Anderson and one that I’ve never altered. Even thespians have their superstitious rituals. With music cranked and adrenaline beginning to pump through my veins, I check to make sure that cigars, handkerchiefs, newspapers, reading glasses, and hat are all where they need to be on stage and back stage. A box of biscuits. A box of mixed biscuits. A biscuit mixer. As I mentioned earlier, each stage troupe has their own unique rituals. Ann Wilkinson enjoys an exercise of “singing the theatre alive” which is based on a tribe in Africa who each year gather to “sing the forest alive” by chanting/singing the same phrase over and over and over for an entire week. We divide into groups and perform the chant (phonetically: Ah-mah-ee-boo-oh-ee-ay) in a round with each group choosing a different physical action to complement their vocals. We then will get our pre-show speech in a quick word of encouragement from the Director and/or Stage Managers along with the occasional instructions or reminders before being dismissed to get into costume. I go into the Costume Room and pull my costume from its place on the rack and head to the locker room to change with the other actors. By the time the costume is on the Stage Managers are generally calling for “places” and it’s time to head through the back stage entrance to take our places for the start of the show. 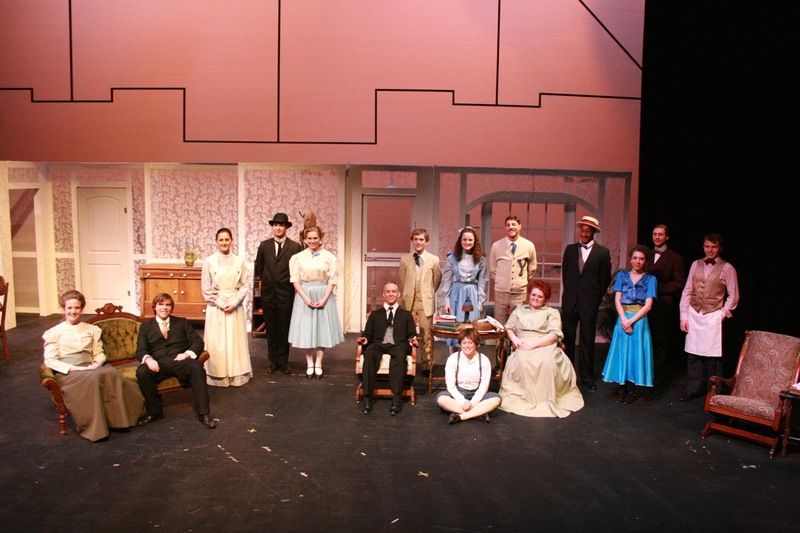 Cast photo taken after Dress Rehearsal. It’s been an enjoyable run. We’ve had good audiences and I’ve thoroughly enjoyed working with the exceptional young people and profs at Central. Thanks to everyone at Central for their cooperation and support. Thanks to family and friends who have come out to see the show. Tonight is the final performance and the curtain will close another production. There is always a bittersweet feeling with closing night. While I’m ready to have my evenings and weekends back, there is a sense of loss as I think of the fun and camaraderie I’ve enjoyed in the past weeks. Next up for Wendy and me is another production of The Dominie’s Wife for the Pella Opera House during Pella’s Tulip Time. It will be Wendy’s third production of the show and my second. We’ll begin production meetings next week. Stay tuned!